Month four Tigress’s can jam canning challenge and the chosen ingredient is herbs. This is a funny one, as herbs are a flavouring and sidekick rather than a main player ingredient so thinking cap required. Ingredient wise, this is where everybody needs good neighbours. Helen and Steve a few doors one side have a thriving patch of rhubarb but noone in the house enjoys rhubarb enough to make use of it. As explained in my last post (just yesterday) Jane’s garden, a few doors down on the other side, has angelica growing so can provide the herbal element needed to meet the can jam criteria. So both my ingredients couldn’t be more local, more seasonal or more freely available. Angelica can be used to offset the tartness of fruits such as currants, gooseberries and rhubarb so it is an ideal pairing. With the sun at last making an appearance and the need to get to grips with horticultural tasks, naturally my thoughts have turned to the need for cordial as a suitable refreshment whilst I work. I started looking for inspiration and found it in Fancy Pantry by Helen Witty. I’m liking the look and feel of this book, published in the US in 1986, found a while ago on Amazon. It is full of recipes for stocking your pantry, including some preserves, pickles and relishes, and for me, someone in the UK not so familiar with canning, it includes reassuring processing information where relevant. Since it arrived in the post I have spent many hours enjoying this book and there in the ‘sippin’ substances’ chapter a recipe for rhubarb nectar caught my eye and seemed a good starting point for my April Can Jam project. 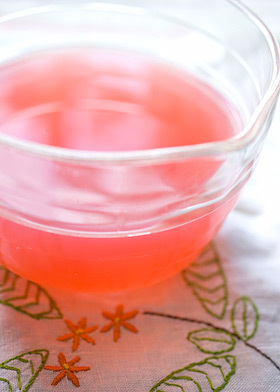 Cordials are really easy to make, like the first process of jelly making without the worry of achieving a set at the end. I am really pleased with the result. 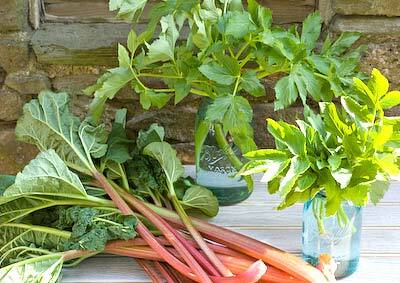 I used the angelica leaves and at my first attempt layered them with the rhubarb to let the flavours infuse. I didn’t feel that the angelica made its presence felt strongly enough so have devised another method to make an angelica syrup which is then added to the rhubarb. I’m going to be making lots more of this cordial, with and without the herbal note, as the resulting drink is supremely versatile and quite delicious. 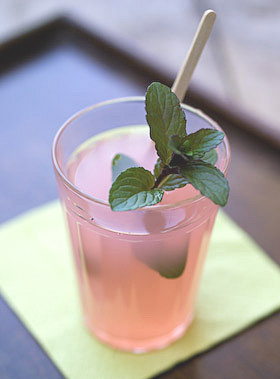 Simply serve as a refreshing drink diluted with still or fizzy water or as part of a more grown up cocktail, such as a pink gin fizz, made by mixing equal measures with gin over ice and topped up with soda and a sprig of mint. There is plenty of room for experimentation, you just have to watch that nothing you add overpowers the exquisite rhubarb flavour. The cordial is also a fabulous colour. Wash and drain the angelica and shake dry, then chop roughly and place in a dish in layers with half of the sugar sprinkled in between and over top to cover. Leave for 24 hours until the sugar has turned to syrup. Put into a pan and heat gently, stirring to be sure all the sugar has dissolved. Bring to the boil then remove from the heat, pour back in the dish and leave overnight. Return to the pan, bring to a simmer and cook gently until the leaves begin to look transparent, which should only take 5 minutes or so. Pour through a sieve to leave a clear syrup. This method should extract as much of the angelica flavour as possible. Cut the macerating time down as required if you are in a hurry. Wash and drain the rhubarb, removing leaves and trimming the ends. Cut thicker stalks in half down the middle then chop into 1cm sized pieces. Place in a pan with the water, bring to the boil and simmer gently for 10 – 15 minutes until cooked through. Pour into a suspended jelly bag and leave overnight to drip through, catching the juice in a jug. Prepare the canning bath and sterilised bottles. Place the rhubarb juice, angelica syrup and remaining sugar in a pan and heat gently, stirring all the time until the sugar is dissolved. Bring to the boil then remove from the heat, pour into your hot bottles, leaving the required headroom for your bottle type (mine shown in the picture looks like it has a bit too much headroom! I’ll do better next time) seal and process for 10 minutes. Leave till cold and label. For more info about how to hot water process, refer to the guide here. After candying the small quantity of angelica stems I had and using some of the leaves to make my rhubarb and angelica cordial, I still had some leaves left over. Hating the thought of wasting them I decided to make a second cordial. As the intention was to ‘can’ the cordial and I was worried whether it would be acidic enough to safely do this way, it seemed like a good idea to make it following a similar method you might use when making elderflower cordial. For this you include some lemon juice as well as a small amount of citric acid to help its keeping qualities. I have a stock of citric acid, bought a while back at my local chemist. I know some people find it difficult to get hold of but it can be found at home brew shops and on ebay as well if your pharmacy is unable to supply. I wasn’t at first sure whether the lemon and citric acid rather overpowered the more subtle angelica flavour but I’ve just drunk a glass diluted down with sparkling mineral water and the flavour came through in a lovely distinctive way which sets it apart from the elderflower version. Make a sugar syrup with the sugar and water by heating them together in a pan, stirring until all the sugar is dissolved and bringing to the boil. Remove from heat and add the citric acid. Put the angelica, lemon juice and zest in a bowl and pour the syrup over them. Cover the bowl and leave for 24 hours to macerate and infuse. Strain through muslin and collect the liquid in a pan. If you are planning to can the cordial so it can be stored, prepare the canning bath and sterilise the bottles. Bring the cordial just to the boil then remove from the heat, pour into your hot bottles, leaving the required headroom for your bottle type, seal and process for 10 minutes. Remove from water bath and leave till cold then label. For more info about how to hot water process, refer to the guide here. This cordial will keep for several weeks unprocessed in the fridge but will store for up to a year unopened after processing. This sounds amazing – very impressed. I never hear about angelica over here in NY; maybe we call it something else? 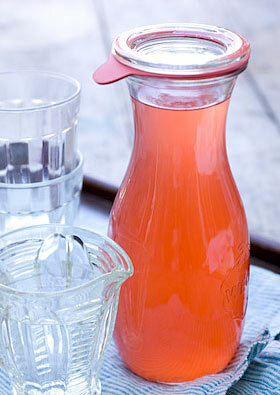 At any rate, I *love* rhubarb, so may have to try out this cordial even without the rhubarb. 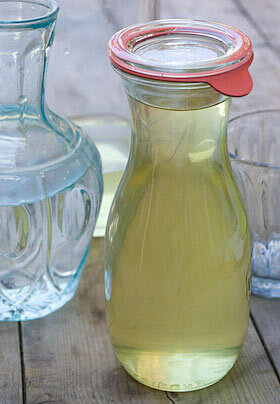 As always, I am jealous of the gorgeous Weck juice jar! this looks delightful and the color is perfectly pink! did i miss the part where you mixed it with vodka or gin?? appears as if it would be divine either way. and gorgeous photos! This sounds amazing: though I also don’t know what angelica is… that photo of the bright pink cordial is quite magnificent! and I am extremely jealous of both your neighbors and your canning jars! Simply gorgeous! So jealous of that Weck jar. And the idea of elderflower cordial-sigh! My two elderberry plants routinely get eaten by deer, so that might not happen. But I did pull the first rhubarb stalks the other day and have it steeping in vodka. The next application will be this cordial!